"A really yummy dessert that will tickle your taste buds. This one has applesauce as well as fresh apples. Serve it warm with vanilla ice cream!" In a medium bowl, mix together applesauce, 1/2 cup brown sugar, 2 teaspoons cinnamon, and salt. Place sliced apples in a large bowl. Add applesauce mixture and stir well. Spoon mixture into baking dish. In a small bowl, mix together 1/2 cup brown sugar, 1/2 teaspoon cinnamon, and flour. Stir in melted butter or margarine. Sprinkle mixture evenly over apple filling. 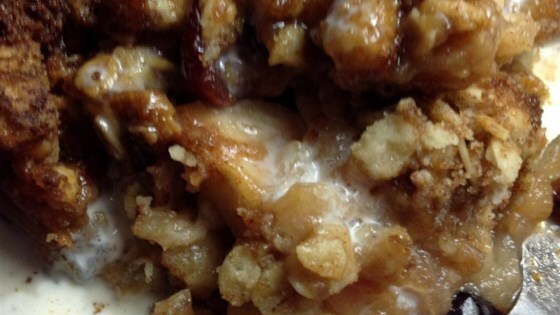 Discover the secret ingredient that makes this the crispiest apple crisp ever! very tasty, i did add oatmeal to this (about 1 C) and sometimes i will add walnuts too. easy and delicious! Loved the applesauce idea. seemed like too many apples for the amount of filling and topping. Didn't get a crispy topping. My family and I enjoyed this moist dessert. I did, however, add oats to the crust mix. My son has requested more oats next time, too. I'll make this again--most likely tomorrow night! i wouldn't make the top the same way. I'd suggest cutting the butter into the top stuff, I like a crumb topping, not a sugar layer. Don't melt the butter! Melting the butter creates a paste, not crumbs. I used the topping without the rest of the recipe since the topping was the most like my mom's recipe that I could find. Should have read reviews first, knew the butter should not have been melted, did it anyway, not crispy like I wanted it, very dissapointed, was tasty, however, won't use this recipe again.